After a slight delay, the NHL officially released a full list of players – both protected and exposed – in anticipation of the 2017 NHL Expansion Draft. Following the announcement, moments of shock and disbelief were prevalent as fans poured through each and every franchise’s protected lists and, in doing so, were blown away by some of those secured as well as left exposed. 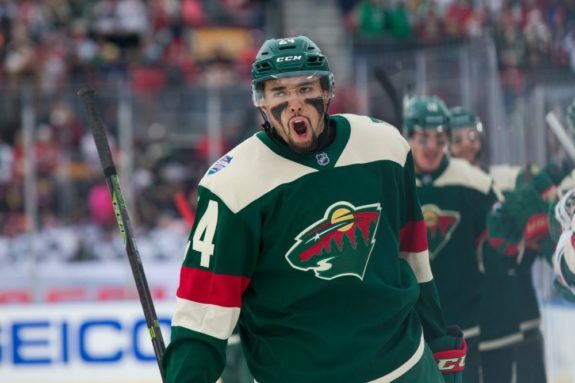 In fact, a number of players of elite skill and potential were, incredibly, exposed to the Vegas Golden Knights, namely Sami Vatanen, Dan Hamhuis, and Mathew Dumba, amongst others. While many individuals were exposed due to a variety of organizational complications, there were also a number of players protected who, arguably, should not have been. Unfortunately, the most controversial of which arose from the Toronto Maple Leafs’ decision to secure the services of Matt Martin. Signed by the Leafs to a four-year contract on Jul. 1, 2016, Martin’s protection resulted in the exposure of both Brendan Leipsic and Kerby Rychel – two of the franchise’s more promising forward prospects. So, what was the Leafs’ management team thinking? Well, let’s do our best to analyze the puzzling decision. What Were the Leafs Thinking? Toronto’s decision to protect Martin ahead of the coming Expansion Draft is one which has split Leafs nation into two distinct groups. On one hand, many are pleased by the choice, as they feel as though Martin plays a crucial role in the locker room and is a tremendous influence on the team’s young stars. On the other hand, many are displeased by the decision, as not only will it force the exposure of two highly valuable prospects but, in doing so, ensure the presence of a highly paid and largely underperforming fourth-line player. In the end, these two perspectives were surely debated extensively by Toronto’s management team prior to arriving at an official decision regarding Martin’s future. So, what were the key talking points behind each outlook? Martin’s value with Toronto is derived strictly from his intangible assets and was the major reason why he was protected from the Expansion Draft. In other words, Martin’s impact with the Leafs doesn’t come via timely goals or high-end offensive plays but, rather, his ability to lead and act as a strong, reliable voice in the locker room. In fact, Head Coach Mike Babcock has long praised the capabilities of Martin, as his presence within the young roster as well as his intimidating stature has been of immense value to the rebuilding franchise. Although Martin’s average time on ice dropped nearly two minutes in his first season with Toronto in comparison to his last in New York, the Windsor, Ontario, native has remained constant in the Leafs’ lineup. Even after the arrival of Brian Boyle and the breakout of Kasperi Kapanen late in the 2016-17 season, Martin earned his regular shift despite growing criticism. As one of the most respected faces in Toronto’s locker room, it would appear as though Martin’s intangible assets will hold him in place for the considerable future, not to mention the three years remaining on his current contract. While, as we have seen, Martin is a crucial member of the Leafs’ leadership core, the veteran winger’s diminishing on ice abilities are a cause for concern and are surely the major reason behind the mass desire for his exposure to the Expansion Draft. As mentioned, Martin’s average ice time fell dramatically in 2016-17. While he had averaged roughly 12:00 throughout his career with the Islanders, Martin logged a mere 8:54 per game in his first season with the Leafs. Whether or not this was to plan or was simply due to Martin’s inadequate on-ice abilities remains unclear, however, it goes without saying that much more is desired from a player holding a long-term contract. Further, Martin posted career-low offensive totals across the board. 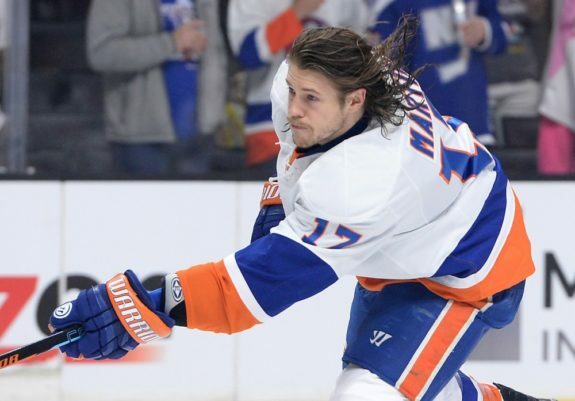 Now, as we discussed, Martin wasn’t brought to Toronto to shoot the lights out, however, his spurts of skill and quality shot were two qualities displayed while with the Islanders which added to his allure in free agency. In fact, Martin’s five goals and nine points amounted to the lowest point total of his seven-year career, as well as one of the lowest of any player protected from the Expansion Draft. In addition to his lack of individual production, Martin’s trademark style of play also faltered with the Leafs. Known as one of the NHL’s best body checkers, Martin managed just 300 hits in 2016-17. Of course, that is a ton of physical contact, however, it is considerably less than Martin has achieved in years passed and is in no way similar to his career averages. Further, Martin’s penalty minutes spiked last season despite his diminished playing time – an issue which cost Toronto a goal on numerous occasions. So, as we have now seen, the Leafs were surely torn between two perspectives when it came to protecting or exposing Martin. As an excellent leader and individual, Martin’s value in the locker room as well as on the ice was surely an overwhelming factor. Yet, conversely, Martin’s diminishing lack of production – both offensively and physically – were surely also considered and analyzed with growing anguish. As such, Toronto’s management team must have been resoundingly convinced by Martin’s intangible qualities, as protecting the veteran forward meant exposing both Rychel and Leipsic. Although both remain young and in need of greater seasoning, Rychel recently began to flourish with the Toronto Marlies and Leipsic is surely NHL ready having drawn comparisons to Brendan Gallagher of the Montreal Canadiens. If one of Rychel or Leipsic is, in fact, selected, the hockey world will surely view the Leafs’ shocking decision with greater disdain – if possible. Considering the potential collateral damage which could quite easily arise from the decision to protect Martin, it would appear as though the Leafs have made a significant error. Although Martin is a valuable player in some regards, ensuring his services while sacrificing the future of a young prospect simply does not comply with the long-term rebuild which the franchise allegedly remains committed to. Although we may not truly see the fall-out from this decision for quite some time, the choice to protect Martin rather than other assets could significantly jeopardize Toronto’s future success. Exactly how protecting a veteran forward of depreciating skill is more important than ensuring the services of a quality young prospect is simply incomprehensible and, frankly, unacceptable.